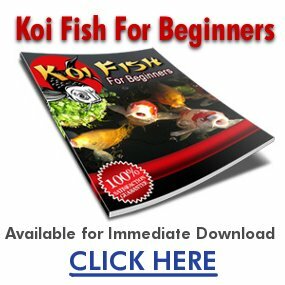 how deep should a standard koi pond be? i want to make a koi pond but i dont know how deep to make it. What is a good depth for a koi pond to house about 8 koi, about 8 in in length and still growing. three feet or deeper both for wintering and for hiding from predators… also to make sure there’s enuff room for them as they grow…..
koi can grow really big, as big and may be more than a feet, so keep them in medium size ponds, about 50-100 gal should be fine for them, small koi dont really need much space, but if u want them to grow, the bigger the pond, the better! Minimum 18″ , but 24″ , or more is better . Around 2 to 3 feet. Our pond has a deep end of 3 feet and a shallow end of 2 feet, we have 3 koi and 5 goldfish and they do just fine! Depends where you are. Midwest, shoot for 3′ minimum so the fish can survive the winter. If you go deeper than 4′ you need some serious design work because the water on the bottom can become O2 deprived fast, and you need a bottom drain or extra pump for circulation. Apart from that, it’s ability and budget. I have a pond on our deck that’s only 18″ deep that we remove the water from during the winter – the koi and goldfish go in the 9,000 gallon main pond.